This micro quadcopter kit from Canadaquadcopters.ca includes a light weight carbon fibre frame, a Lulfro brushed board, a set of CL-0820 motors and accessories. We previously reviewed some other kits from various vendors that don’t come with frames, and it is inconvenient for people without a 3D printer. Get your Micro Quad Kit from CanadaQuadcopters.ca. I would like to give a shout out to CanadaQuadcopters.ca. The owner Chris, just opened the store a couple of months ago and currently specialized in micro multirotor parts. They are based in Toronto. Normally when we are trying to source parts for micro quadcopter, we would have to shop everywhere globally for the bits and pieces. I really appreciate Chris’s efforts to enable hobbyists to get everything they need from just 1 place. Soon they will also carry micro FPV setup so make sure you check back at their store later. Chris is a really nice guy to talk to, if you have any questions about his products just get in touch with him! Update (22/09/2016) – We have received multiple comments regarding the shop CandandaQuadcopter.ca not responding to emails and telephone calls, neither fulfilling the orders. If you wish to order from them, it’s advised to contact them first to make sure they are still open for business. I use the same battery in my micro quads, they are pretty decent. I get mine from Hobbyking and they all have reverse polarity. This issue has been fixed in the one that came with the kit. 3D printed frames are affordable and reasonably lightweight, but they also can be fragile and tend to bend after a few crashes. They also lack rigidity although it’s not generally a huge problem given the light weight of the quad. Overall 3D printed frames are great for indoor relax flying and cheap enough to replace. However I would recommend a carbon fibre frame for your micro quad, if you fancy some fast flying outdoor without worrying about breaking it. Carbon fibre is also more rigid and lighter which is the ideal material even for micro multicopters. CanadaQuadcopters.ca offers 2 types of 110 size frames, one is the Micro H Quad frame (left) and the other is the Racing edition frame (right). The Micro-H Frame is a bit bulkier, and appears to be really tough. I love the rubber motor mounts, which just makes building so much quicker and easier. The Racing frame is light as feather, but it’s a bit tricky when it comes to mounting motors. Here is how I did it and it took a while for me to get it.Here is how Chris does it in his video. However because of that, I feel like there isn’t enough carbon fibre in the middle of the bottom plate to support the flight controller, It’s easy to have the FC tilted one-sided if it’s not mounted properly. If you are also building this frame, be aware that you might have trouble accessing the serial pins on the Lulfro board after you put the top plate on. My work around was to bend the pins, so I can still plug my cables in through the gaps and from the sides. But anyway, this quad is lightweight! Excluding battery and FPV gear it’s only 32 grams! This is 10 grams lighter (20%) than my previous build using a 3D printed frame. Same as the Beef Board, the Lulfro is a 32-bit FC with integrated FETs (ESC). It comes with Baseflight pre-flashed, but you can also flash Cleanflight and even Betaflight on it with the Naze32 firmware..
For setting up, there is no official documetation, but Chris has kindly put together a manual and it can be found in the Lulfro product page. Setting up is extremely similar to the Beef board if you have experience with it, this board is a piece of cake. By the way in the documentation, one of the picture suggest you need to short the bootloader pins to flash Cleanflight. I found that’s not necessary, I could flash without shorting those pins. This board is weights only 2.4g, dimension is 25mm x 25mm. FETs are rated 6.3A each compared to 4.2A on the Beef board. You should check out my comparison table of different Brushed boards. CanadaQuadcopters also carry Frsky Micro RX receiver that works with Taranis TX. Here is how I soldered mine. Filtered 5V for your VTX! The 5V pins next to the TX/RX becomes a 5V output when you connect the LiPo battery (Step up voltage regulator). You can use this filtered 5V output for your FPV gear if they support 5V as input. I am able to use Lulfro board with my FPV setup, no noise at all even at full throttle, so filtering is working great! The board requires a CP2102 or FTDI cable to connect to the computer (ie. Cleanflight/Baseflight configurator), or flash firmware. I used the cable from CanadaQuadcopters.ca, and it worked perfectly. When you are putting FC on the frame, make sure you have the correct orientation. There is an arrow on the board and it should face forward. Here I am showing you a WRONG example. You can certainly rotate the board, and set yaw offset in Cleanflight, but make sure you are connecting the motor in the correct order. Last time I compared the batteries and props, but that was a bit subjective and I didn’t make any scientific tests. This time I used my digital scale to take some numbers so hopefully the results are a bit more convincing. Basically I strapped the quad to some weight, and put it on a digital scale. Write down the initial weight, then apply full throttle to see how much weight it can reduce by lifting. The difference would be the total thrust generated. Final result is then divide by 4 to get thrust per motor. *Lady Bird Props were from Hobbyking, Hubsan props were from CanadaQuadcopters, Rolling Spider props is made by Parrot. Motors were used in this build. The motors I got from Multirotor Superstore (MS) actually performed pretty close to the MMW Dark Edition. Also bear in mind that I have had more than 30 flights on the motors from MS already, so performance should be a bit better if they were new. Note that these motors are not designed to be run at constant full speed. The thrust isn’t linear and always tails off as you increase throttle (just like any other motors really). I cannot guarantee this test was 100% accurate, because it was carried out on non-standard testing equipment. But that should give us some ideas how the motors react to different props and batteries. With the clean 5V output on the Lulfro, it is now possible to use my one of my earliest micro FPV setup, you can build it under $20 (TX5823 200mW VTX + micro Camera). 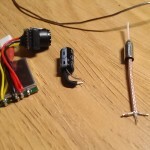 I used to connect this FPV setup to the main LiPo, but I found the power is too noise for it, so I gave up using it. Since both VTX and camera support 3.3V-5V, we can safely run it off the filtered 5V output on the Lulfro board. But be aware that the Banggood camera is 170 degree lens, some people might find it too wide. Surveilzone has one with similar spec that does 120 degree, but it’s twice as expensive. Also note that this setup works only on Boscam frequency Band E.
Check out how I built the low cost micro quad FPV setup. Example how it would look like :) I will probably put the camera between the plates in future mod! I will come back and update if I have any more discoveries or videos on this build. 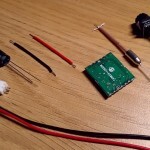 Chris’s build video on his Micro-H Quad. And here are a few pictures showing a build using the Micro-H frame. Just read the blog and was so impressed by the lulfro board ( and the blog ) that I decided to order one from CanadaQuadcopter… Only to then find all the comments about them being entirely unresponsive and potentially closed down. I’ve already placed an order, and my account has been billed, but other than the automated emails that are system-generated, I’ve received nothing back from contacting them either by Email, Facebook or even Telephone! I think that Oscar you should update your blog post and remove the link and maybe add a warning… I can’t really believe that someone would allow an e-commence system to take payments even if the shop had gone out of business, but right now I’m not optimistic… Does anyone have any more info about CanadaQuadcopters.ca? Have they closed? I did contact them back in March and they said they were still in business but have not contacted them again since. I will put a warning up. Did you pay by Paypal? hopefully can get your money back. Just a quick update for everyone… I’ve actually just spoken to Chris from CanadaQuadquopter… They are very much still in business and taking orders… seems like a great guy. Looking forward to my micro-build!! :-) Confidence restored! Is canadaquadcopter still in business? I emailed them and tried live chat many times in the past days and I didnt get any answer at all ?? I am not sure TBH… if they are not replying to emails probably means they are not in business i guess. I saw on the pictures on this post that the Micro H Quad frame and the Racing edition frame, with complete FPV + lipo build, show only a few (2?) gramms difference but in favor of the Mini H which is supposed to be the heaviest. Is it really the case ? I am hesitating between the two frames. I love the Racing edition design but I am a bit afraid by mounting the FC and motors on the Racing Edition frame. So if the weight gain does not worth the struggle… I might go for the Mini H.
if you are not picky about weight, then yea the Micro H frame is easier to build. do you recommend soldering some small pins in the motors pad, so i can disconnect and reconnect motors easily? I personally don’t as I don’t change motors that often, and I prefer to save some weight. Could you measure the thickness of those carbon frames? I am currently designing my own micro frame and wondering what thickness to use. How would you compare the flight performance of the three micro-quads you have built? I’ve got a 250-sized quad, but want something for indoor practice using Cleanflight and acro-mode. I’ve got a nanoQX, but wanted something with Cleanflight, but still something small enough to use indoors. Knowing this information about how I intend to use it, would you pick the lighter frame or the heavier frame? for the 8mm motors, i can hardly tell the difference, they all fly very well! much better than the 7mm motor build! I will never look back! I’m considering building my first quadcopter and I’m very tempted to make it a micro. Would you say building a micro rather than say a 250 makes much difference as a beginner? Also from what I’ve read it looks like you have to buy a more expensive radio to be able to use the micro receivers. Is this correct?